1. Everyone in the organization adores Teddy Bridgewater. And, prior to last summer’s horrific knee injury, he was genuinely believed to be the future. But here’s the cold hard truth: Sam Bradford is a markedly better quarterback than Bridgewater. Bradford, with superior arm strength, accuracy and sense of dropback timing, is the one the Vikings worry about re-signing after this season, not Bridgewater (whose fifth-year option was not picked up). 2. It’s only a matter of time until second-round rookie Dalvin Cook officially becomes the featured back. We’ll find out how reliable he is as a blocker and receiver in passing situations. As a runner, Cook has more talent than former Raider Latavius Murray, a 230-pound back who runs with very little attitude and power. ​3. Did the Vikings overspend for ex-Lion Riley Reiff to be their new left tackle (five years, $26.3 million guaranteed)? Probably. And did they overspend for ex-Panthers right tackle Mike Remmers (five years, $10.5 million guaranteed). Again, probably. But anyone who watched this team in the second half of last year can’t blame them. After legions of offensive tackles went down and T.J. Clemmings, whose NFL future (if there is one) is as a backup guard, was put back into the lineup at left tackle, the offense had to reduce its passing game to screens and hastened three-step dropbacks. Bradford & Co. never had a chance. 4. This will be a three-receiver offense. The Vikings are solid at wideout and, besides seventh-year TE Kyle Rudolph, they have no proven tight ends and fullbacks. Rudolph is a vulnerable run-blocker but steady inside-aligned receiver who can get open within the context of a play design. 5. This is the year Stefon Diggs emerges as a 1,000-yard receiver. It would have been last season if Minnesota’s passing game hadn’t been derailed by O-line injuries. (Diggs finished with 903 yards on 84 catches in 13 games.) He has outstanding short-area quickness and acceleration—two traits that can make him dominant from the slot. ​6. The Vikings are a predominantly two-high safety defense. They love to play zone coverage out of this structure. The reason more teams don’t play with two-high safeties is it leaves you with one less body in the box, which hurts your run defense. The Vikings, however, have a trio of stingy run-stoppers inside with oversized linebacker Anthony Barr, athletic linebacker Eric Kendricks and gargantuanly underrated nose tackle Linval Joseph. Defensive ends Everson Griffen and Danielle Hunter aren’t great edge-setters, but in a two-high scheme they don’t need to be. Edge-settings falls to the cornerbacks or safeties (depending if it’s Cover 2 or Cover 4 zone). 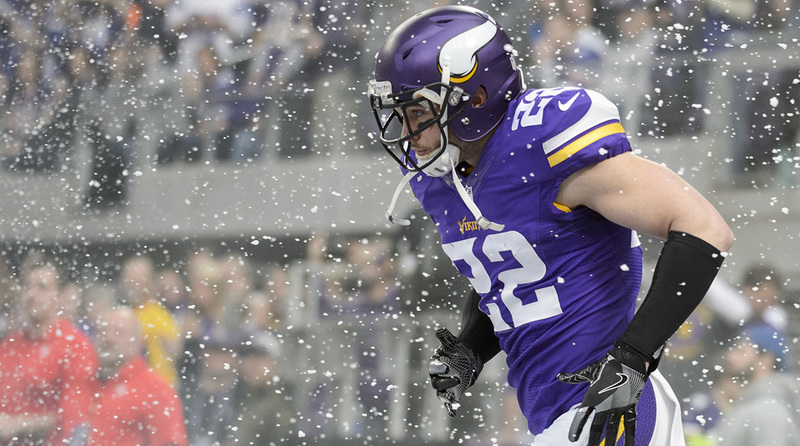 All of Minnesota’s defensive backs, led by Harrison Smith, are sure tacklers. 7. Speaking of Smith, he’s the guy who makes much of this defense go. Besides having terrific awareness and poise back in space, and almost never missing a tackle, Smith is a select edge blitzer in head coach Mike Zimmer’s staple double-A-gap concepts. 8. Another key component of that double-A-gap is Kendricks. With both linebackers walked up to between the guard and center, it’s imperative they have the athleticism and wherewithal to retreat into landmark zone coverage when the blitz is merely a bluff. Kendricks is tremendous here. In fact, aside from maybe Carolina’s Luke Kuechly and Thomas Davis, he might be the best all-around zone coverage linebacker in football. 9. Fifth-year pro (and recently paid) Xavier Rhodes has blossomed into a bona fide No. 1 corner. He traveled with top receivers last season, including into the slot. That’s not something Zimmer typically does with his cornerbacks. Rhodes is most effective along the boundary. He has long arms and strong hands; when he jams receivers outside, he can gradually force them toward the sideline, out of the action. ​10. At 34, defensive end Brian Robison’s role is scheduled to be reduced. More of his snaps will go to rising 22-year-old Danielle Hunter. That doesn’t mean Robison can’t still play. He showed up again and again on film last season. He’s an excellent technician with agile body control and the ability to play inside or outside.